Wolves have signed Jonny Otto for a joint club record fee of £18million. The left-back has penned a contract until 2023, having spent the first half of the season on loan from Atletico Madrid. 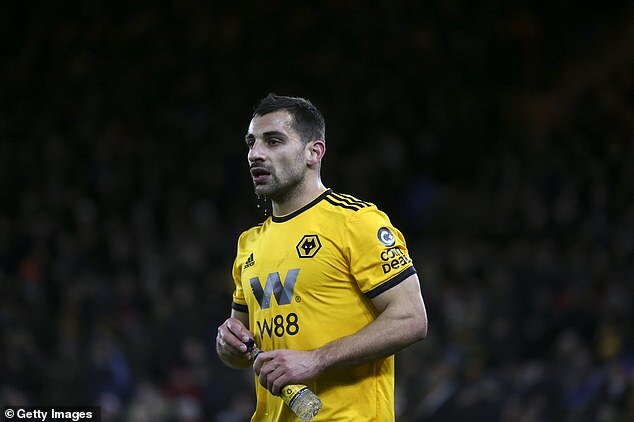 He has played 22 times for Wolves this season, scoring once, with the club sitting seventh in the Premier League. ‘I’m really happy to continue to be involved with the team. I am very happy here, the truth is that it was very easy to decide,’ Jonny told the club’s official website. ‘It was a great step for my career,’ he added. ‘It was a very nice debut with the national team and the truth is that it was one of the most important moments of my career so far. Jonny began his career at Celta Vigo, making over 200 appearances, and joined Atletico Madrid last summer. He never made an appearance for the Rojiblancos, however, immediately heading to Wolves on loan. Jonny joins Adama Traore as the club’s record buy, with Traore having moved from Middlesbrough for £18million last summer.